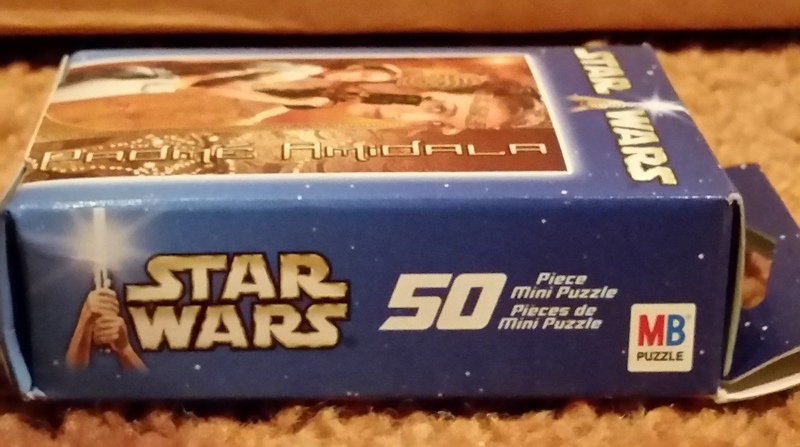 This mini-puzzle features two images from Star Wars: Episode II — Attack of the Clones. I imagine that it is approximately 5″ x 7″ assembled. 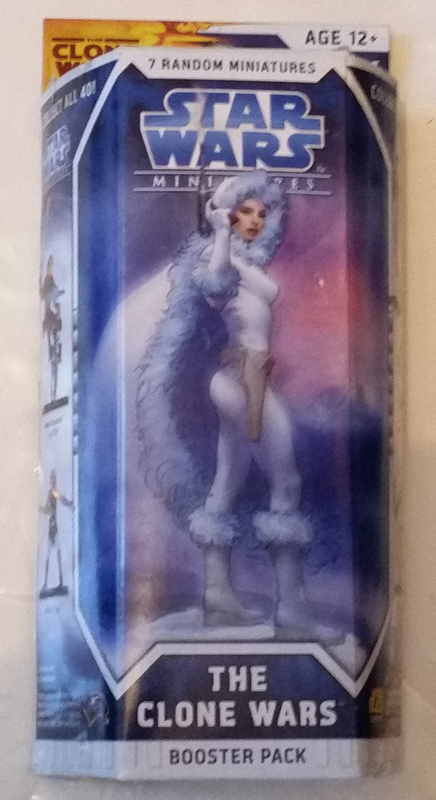 Terese Nielsen created the art that is used on one of the boxes for The Clone Wars booster packs for the Star Wars Miniatures line from Wizards of the Coast. Following the Celebration Japan featured two weeks ago, this is the second licensed art of Natalie Portman in the Ilum outfit. On the other boosters, an image of the actual miniature from the line is pictured. I purchased a case or half of a case at New York Comic Con in February 2009. Dave Filoni probably won’t say if this was the inspiration for the nose art seen in the “Bad Batch” arc of Star Wars: The Clone Wars, but William O’Neill was certainly ahead of the curve in putting the Naboo Senator on the nose of a Republic Gunship. (She is pictured in senatorial dress on a different ship type in the aforementioned episode.) I’m not certain that “Feel My Force” is the title of this piece, but it is the translation of the Aurebesh under the image. I purchased this print for William O’Neill in the Celebration Art Show at Star Wars Celebration Anaheim in April 2015. 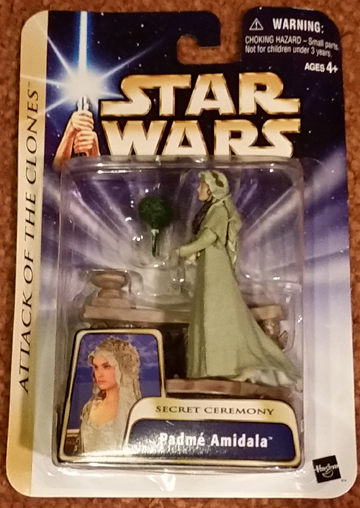 This is the fourth figure in the Saga line to feature the Senator from Naboo. She is portrayed in the gown she wore to marry Anakin Skywalker at the end of Star Wars: Attack of the Clones. The figure comes with a base shaped like the balcony on which the secret ceremony took place. I bought this figure at Walmart on August 30, 2003. 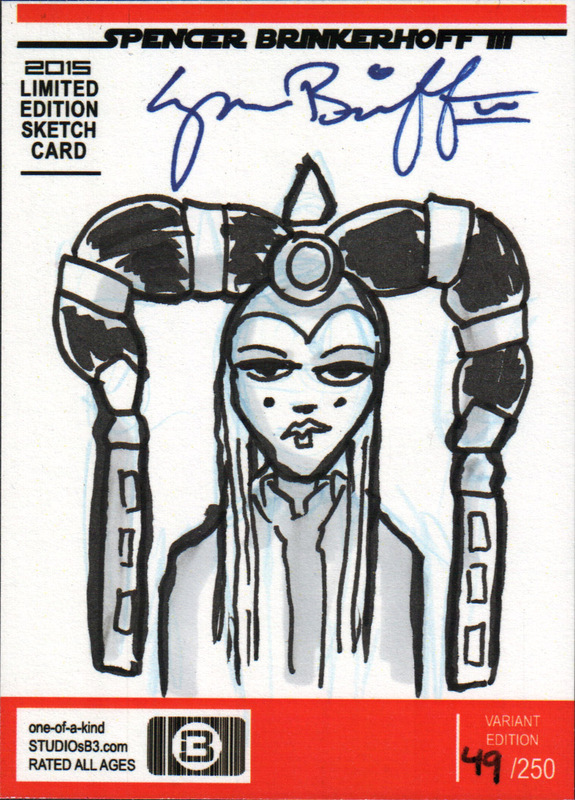 I guess I commissioned Spencer Brinkerhoff III to draw Queen Amidala in the outfit she wore to address the senate in Star Wars: Episode I — The Phantom Menace. It would seem Spencer is intending to do a series of 250 sketch cards in 2015. This was my last purchase at Star Wars Celebration Anaheim. After requesting a sketch in this outfit late on Saturday evening, I remembered just after 4:30 pm on Sunday and returned to Spencer’s booth to buy the sketch card that came with a free original trilogy print. Grant Gould seems to be the go to guy if you want art from Star Wars: The Clone Wars. While he focuses on Ahsoka Tano, he does do great work on Senator Amidala. Here he has depicted her in her pilot outfit as seen in the Malevolence arc. 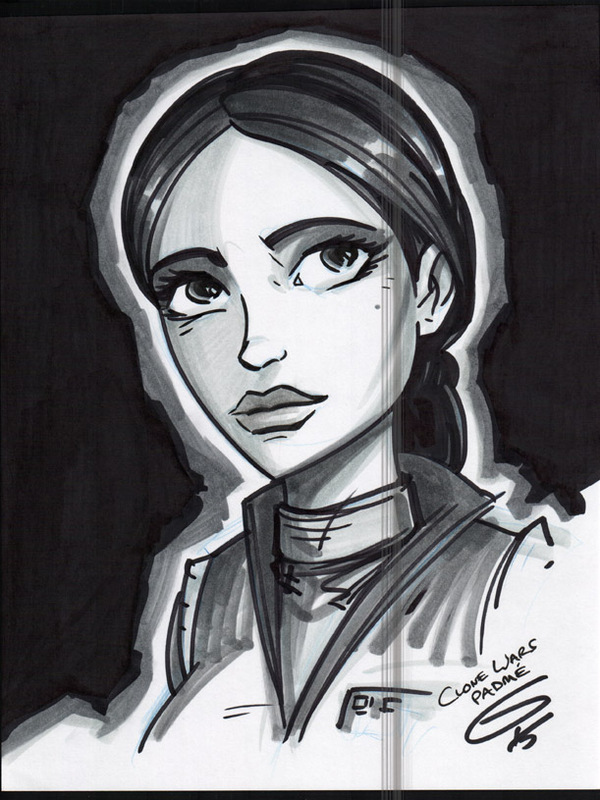 I purchased this sketch directly from Grant Gould in the Art Show at Star Wars Celebration Anaheim on April 16, 2015. Jason Palmer has re-purposed the individual costume sketches from “Many Flavors of Padmé” into buttons. This button has Queen Amidala in her Naboo Celebration outfit from the end of Star Wars: Episode I — The Phantom Menace. I bought this button from Jason Palmer at Dragon*Con in Atlanta, Georgia, on September 9, 2011. 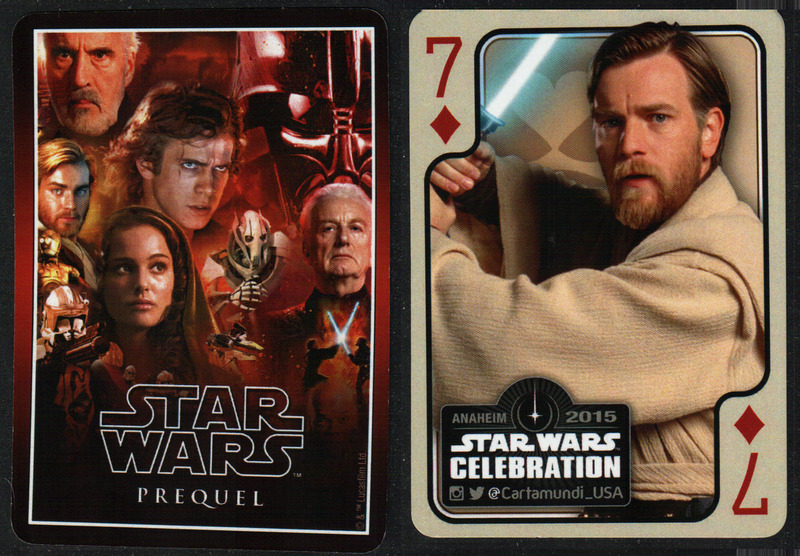 One card featured Obi-Wan Kenobi as the seven of diamonds. The backside features art by Tsuneo Sanda that was on the prequels deck from the Star Wars Saga 2-pack. 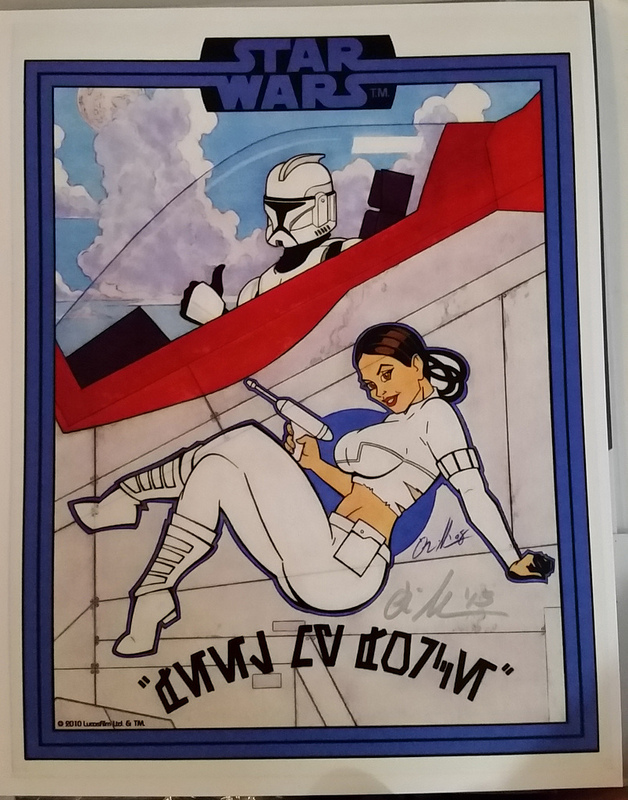 I received this card for free from Cartamundi at Star Wars Celebration Anaheim in April 2015. 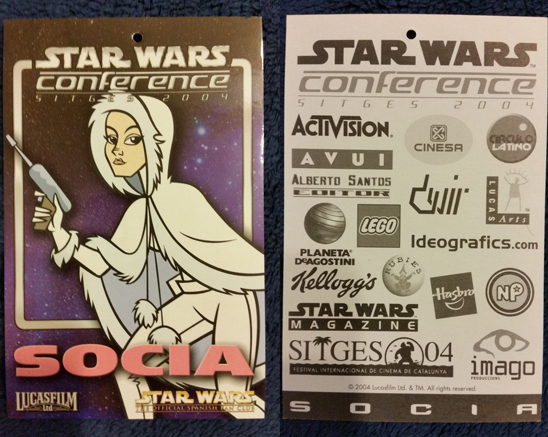 Badges for the Spanish Star Wars Fan Club’s Conference in 2004 featured art from Star Wars: Clone Wars. 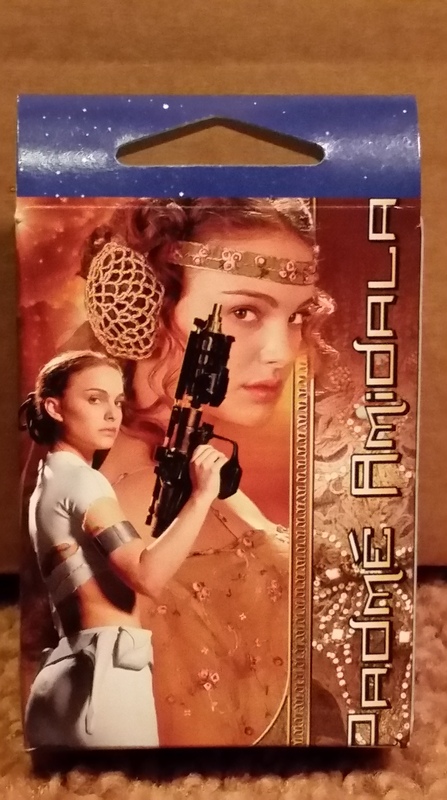 The female admission badge featured art of Senator Amidala in her Ilum “Snow bunny” outfit. I learned about this badge when I visited Barcelona in June 2007 and found back issues of the official Spanish Fan Club magazine.. I purchased the full set of badges from Blanki Canton Corral in September 2007. For Star Wars Galaxy series 5, Topps commissioned Randy Martinez to create a series of 15 character cards. Cards with a silver background were found 1:3 packs. There were 3 parallel versions: copper, gold, and prismatic. One in every 24 packs contained a copper card while gold cards were 1 in every 47 packs and numbered to 770. There was only one prismatic foil of each card with a rarity of 1:17,664. I bought a lot of 525 foil art and etched foil cards from The Collector’s Den. I traded all my duplicate art foil cards to Randy Martinez for the one bronze and two gold cards I needed to complete my sets. After spilling milk on my cards, Randy returned a silver foil art card and I bought replacements for the copper and gold from K and J Non-sports Cards. 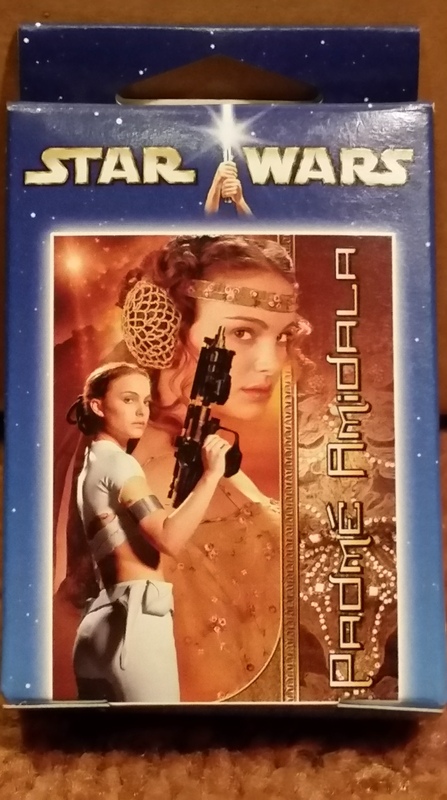 I just acquired an additional set of cards (pictured above) in a Padme Amidala Fan Value Pack from Randy Martinez at Star Wars Celebration Anaheim. I have never seen the prismatic parallel available for purchase.